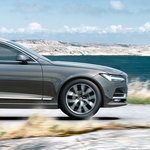 Those in the market for a luxury sedan have many options to choose from, but the Volvo Momentum S90 is a popular choice among consumers for a number of reasons. The model comes equipped with features that provide drivers with comfort and convenience. To learn more about the S90 Momentum's features, read our content below. The S90 Momentum trim comes with a panoramic moonroof that includes a power sunshade. The S90 Momentum is the only luxury sedan in its class to offer a panoramic moonroof as a standard feature. With this feature, you and your passengers can enjoy natural lighting, fresh air, and breathtaking views of the sky. If you want a luxury sedan that offers a spacious cabin, the S90 Momentum is an ideal match. The interior of the S90 Momentum offers an additional 4.5 inches of rear seat legroom than its competitors, such as the Mercedes-Benz E-Class, the Audi A6, and the BMW 5-Series.